Sally Ride, Jim Lovell and Buzz Aldrin bring stargazer's wonder to this piece by Louis Vuitton. 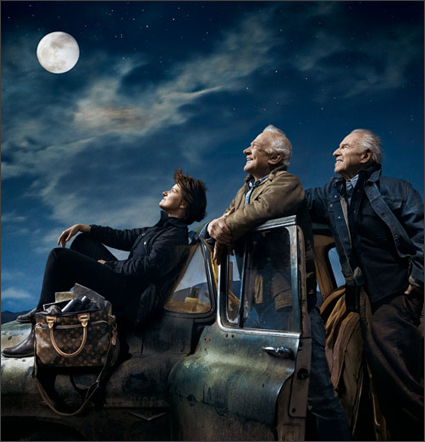 Shot by Annie Leibovitz, the astronauts will grace July issues just in time to commemorate the 40th anniversary of the Apollo 11 mission to the moon. Antoine Arnaut, head of communications at LV in France, says each spacewalker donated a "significant" portion of their modeling fees to Al Gore's Climate Project. As for the bag at left, it's the Vuitton Icare -- an elbow ornament named after Icarus, an icon of Greek myth who dies after flying too close to the sun, losing his wings and plummeting back to earth. Not the bag I'd've chosen to feature with survivors of a successful sky-bound mission, but hey, I suppose it's nice that Icarus, Aldrin, Lovel and Ride all have something in common: a lust for that final frontier. Oh, yeah. You may have noticed Neil Armstrong is missing. This wasn't an oversight on LV's part; after an entreaty or two, "he thought it probably wasn't the right thing to do," Arnault admits. This is clearly a blatant rip-off of Three Wolf Moon.